MARK A. ALTMAN has been hailed as “the world’s foremost Trekspert” by the LOS ANGELES TIMES. Altman is a former journalist for such publications as THE BOSTON GLOBE, CINEFANTASTIQUE and GEEK. He is also the writer/producer of the beloved romantic comedy, FREE ENTERPRISE, starring William Shatner and Eric McCormack as well as the hit TV series AGENT X, CASTLE, NECESSARY ROUGHNESS and FEMME FATALES. EDWARD GROSS has an extensive history of covering film and television as a member of the editorial staff of a wide variety of magazines, including CINESCAPE, STARLOG, CINEFANTASTIQUE, SFX, FEMME FATALES, MOVIE MAGIC, LIFE STORY and SCI-FI NOW. 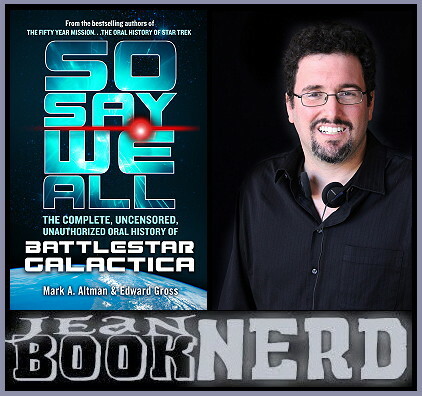 He has written numerous non-fiction books and, along with THE FIFTY-YEAR MISSION coauthor Mark Altman, has written more about Star Trek over the past 35 years than just about anyone else. 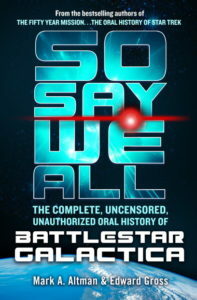 – 12 Winners will receive a Copy of So Say We All: The Complete, Uncensored, Unauthorized Oral History of Battlestar Galactica and Slayers & Vampires by Mark A. Altman and Edward Gross. Sometimes I’m not sure about intelligent life on THIS planet. I sometimes do when strange things happen but then I think I am just being silly. But, it does not stop me from reading about it or dreaming. But, only if they are good beings, not here to kill me!